Android has gone from strength to strength over last 2 years and now accounts for 54 percent of entire Global Smartphone Market Share. That’s really a huge achievement for a Mobile OS, especially because it is also the youngest of the lot. 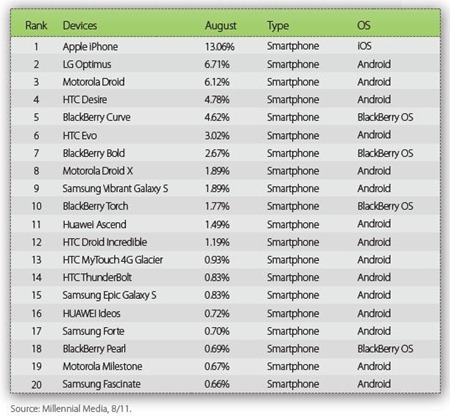 According to the Millennial Media Mobile Mix Report for August, Android accounted for 15 of the Top 20 Mobile Phones for the third consecutive month. The report puts across the rankings based on ad impressions it receives on its own mobile ad network. The report also mentions that Smartphones grew 11% month-over-month, which means Smartphones are more than doubling year on year! If you compare the Smartphone manufacturers, Apple still rules the roost with a decent margin. Apple holds over 23 percent followed by HTC (16.33%) and Samsung (14.55%). 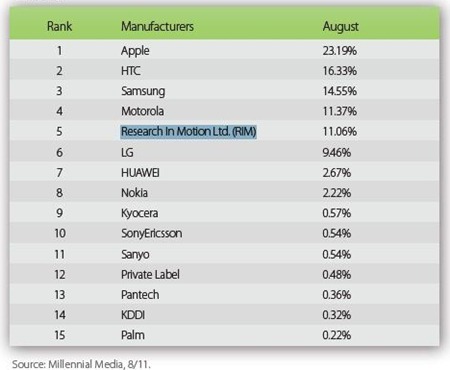 Research In Motion (RIM), the makers of Blackberry’s, have been seeing a constant slide for quite sometime now hold only 11 percent market share. Nokia, worlds largest mobile manufacturer has nothing much to show in fast growing Smartphone category with only about 2.22% share! If you consider smartphone devices, Apple iPhone is a clear leader with 13 percent of all impressions on Millennial Media network coming from it. LG’S Optimus comes in second with 6.71 market share followed by Motorola Droid (6.12%). 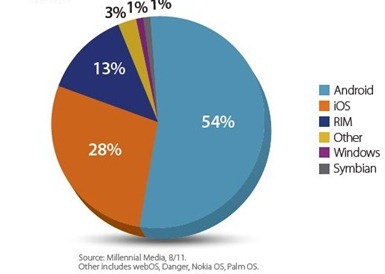 Android rules the Smartphone OS Market with 54% of all impressions on MM network coming from them – Apple iOS, which used to be top mobile OS not so long back now accounts for nearly half of Android with 28% of all impressions coming from them, while Research in Motion comes in at 3rd with only 13% Mobile OS share. The speed at which Android is growing, it wont be long before they may take over the market completely, especially now that they are pushing lite version of Android on cheaper feature phones as well. That will surely bring Android to masses! Read more tips about android devices in http://www.tech2mech.com. Android..relaivelt new but doing doing big things…54% of the OS mobile market share..
Comparision of smart phone OS market share..
Comparision of smart phone OS share.. I didn’t see the Millennial Media report you have linked to as it requires a sign-up. However I am pretty confident that these numbers are not for global sales and are for the US sales only. AFAIK Nokia smartphone marketshare worldwide stands at around 30%. A lot of us analysts and tech blog confuse the US for the world and thus do not specify that the numbers are for US only.